Despite the lack of data, tape occlusion therapy has been endorsed at dermatology meetings as a safe and effective therapy and has been used successfully by dermatologists at our facility. For patients randomized to the duct tape arm, a supply of standard duct tape was provided. 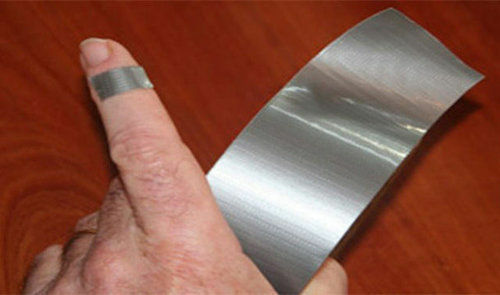 The first piece of duct tape, cut as close to the size of the wart as possible, was applied to the wart in the clinic by nursing personnel. Patients or their parents were told to leave the tape in place for 6 days. If the tape fell off, parents were instructed to reapply a new piece of tape. At the end of the 6 days, they were told to remove the tape, soak the area in water, and then gently debride the wart with an emery board or pumice stone. The tape was left off overnight and was reapplied the following morning. Although no major complications were noted in either group, adverse effects were more common in the cryotherapy arm. The most frequent complaints in the duct tape arm were difficulty in keeping the tape on and minor skin irritation. The most difficult site to keep the duct tape on was the palmar surface of the hand.